peeking out here and there, reminding us that she is ever present to listen to our fears and our prayers…but lest us not forget to express our rejoicing! 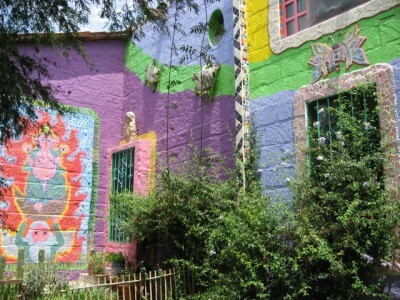 This one belongs to Anado and Richard, who built the amazing Casa Color just outside San Miguel de Allende, Guanajuato. For a peek inside, stay tuned! See more Virgin A Day offerings @ Rebecca @ http://corazon.typepad.com/. ~ by Dawn Elliott on December 2, 2012.
it takes my breath away!! i hope you will post pictures of the inside as well! 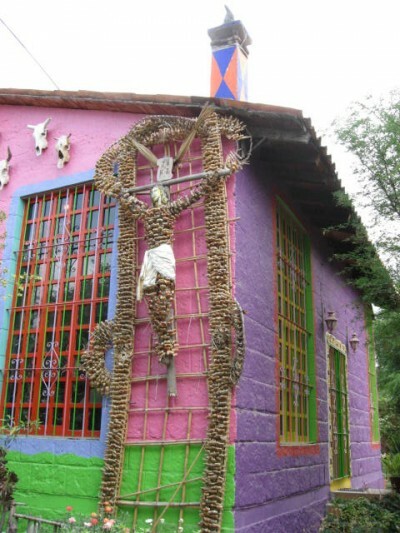 wow, a very colorful home! I am enthralled with the display of bottles (wine?) around the Virgin. That’s a new way to reuse the bottles for me. My son has done some beautiful outdoor hangings with wine bottles. Unfortunately his artistic sense skipped over me. i love that you are sharing one of my most favorite bathtub marys! 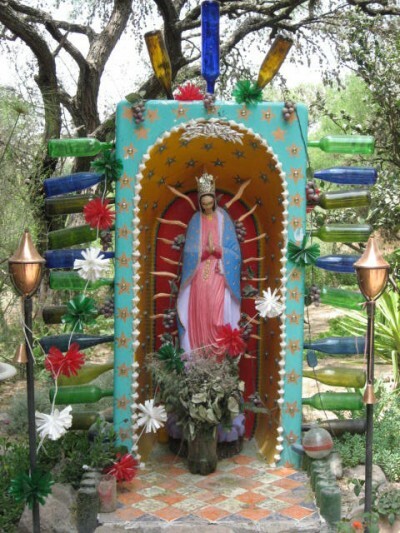 i wish you would share too that the marys of your first two days were discovered on one of my folk art tours to san miguel, of which you have so generously traveled with me on many. 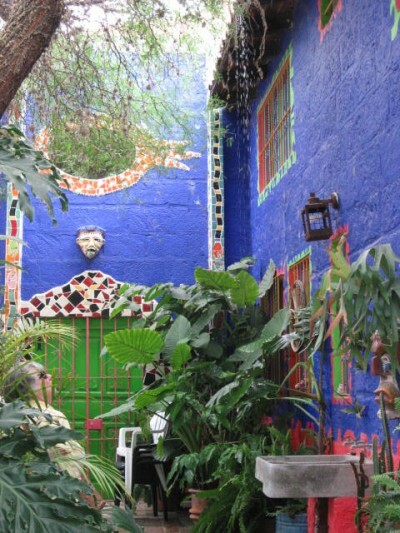 leading these tours is a passion of mine and i need no recognition, but sharing about them, mentioning how you came to know san miguel on one such soulful adventure invites other seekers to come along with us! after all we both share the hope of returning for semana santa in the spring! Dawn, what a beautiful home and awesome Mary. I just love how this has been decorated. Truly breathtaking. This is absolutely incredible! Thanks for sharing. Just seeing that bathtub Mary and that beautiful home makes me happy………..THANKYOU!!! Mary in a bath tub surrounded by a gorgeous garden and embraced by a fabulous house. Love it. Wow, I love that Virgin! And all of those colors of the house!